I only cook fish when I can find extremely fresh product at the market. I discovered some wonderful looking king mackerel at the Asian market that I just had to bring home. 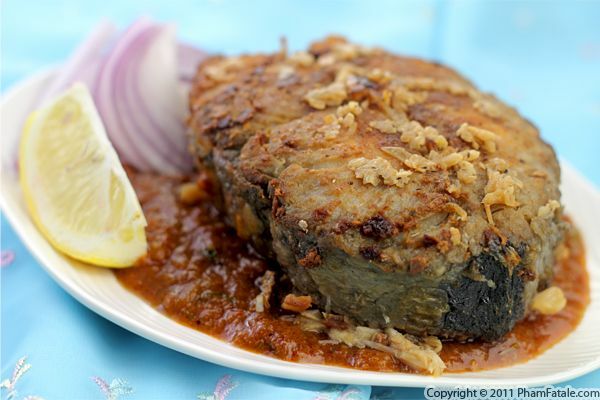 Mackerel is a tasty fish packed with essential, healthy, fatty acids. Instead of a drizzle of nước mắm (fermented fish sauce), I pan-fried the fish steaks and then simmered them in an Indian spiced, buttery sauce called makhani curry. I love this sauce; it's creamy and very flavorful due to the use of garam masala. If mackerel isn't your thing, you could replace it with other fish or go the more traditional way with chicken. It's just as delicious. Chicken kofta is not your average meatball. It's packed with Indian spices, garam masala and chiles. 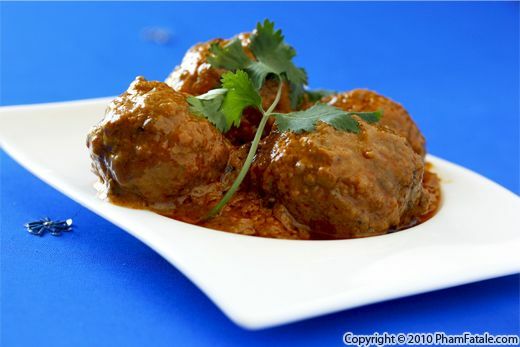 To top that off, in this recipe the kofta are drenched in a rich, creamy curried, tomato sauce made with tomato, onions, cashew nuts, lemon juice, ghee, cream and a few spices. Seriously, what’s not to love? Any time you can say "meatball" and "cream sauce" in the same sentence, something delicious is probably going on. We often make this for dinner parties because it’s a little too rich to serve on a regular basis. Having said that, I find myself coming up with “special” occasions all the time as an excuse to make this dish. If you try it out yourself, I bet you will too!